Nikki Grimes visited three schools in Berkeley last week, sharing her powerful poetry and celebrating the poets of the Harlem Renaissance. 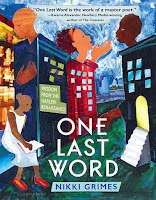 She read from One Last Word, her newest book which combines poems from the Harlem Renaissance with her own original poems. Her voice was rich and resonate, passionate and purposeful as she spoke with students at Willard Middle School, Longfellow Middle School and Maybeck High School. Nikki connected with them right away, talking about the importance of honoring women's achievements. Just as the movie Hidden Figures shows, historians and the press have often downplayed the significant accomplishments of women. "The power you seek is in sight." It was truly an honor to spend the day with Ms. Grimes. We appreciate the wisdom, the kindness and the time she took to share with us. Thanks also to Bloomsbury Publishing for sponsoring this visit, and to Mrs. Dalloway's Books for arranging it. 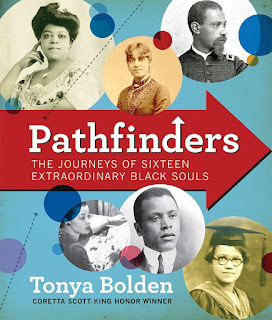 In her outstanding new book Pathfinders, Tonya Bolden shares the remarkable stories of sixteen African Americans who pursued their dreams, excelling in careers ranging from entrepreneur to race car driver, bank founder to spy. Bolden's short biographical sketches are engaging and quick to read; timelines and background information help round out the overall picture. This would be terrific to read aloud at home or in class, highlighting different career paths these remarkable individuals pursued. These fascinating figures will light a fire in today's young readers, helping them think about what careers they might want to pursue. Some may love the artistic career of cartoonist Jackie Ormes, while others will be drawn to Paul R. Williams' journey to become the "Architect to the Stars" in Hollywood. 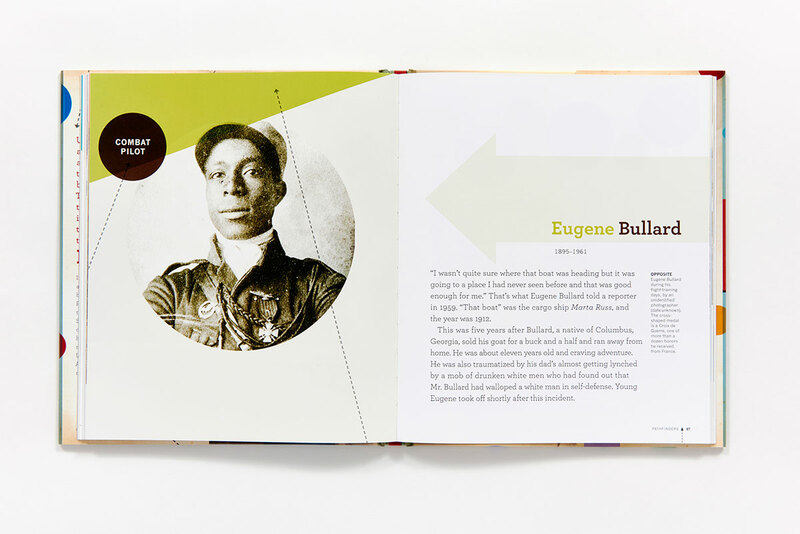 Other young readers may want to seek adventure like Eugene Bullard, who stowed away on a boat bound for Europe--anywhere new was good for him. He was resourceful and determined, eventually finding home in Paris. When World War I broke out, he joined the French army and fought courageously first in the infantry and then as a combat pilot. While the overall length might make some 5th graders reluctant to try this book, the short chapters and lively writing make this easy to dip into. 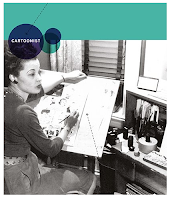 As Kirkus Review states, "The colorful volume uses photographs, advertisements, fliers, theater posters, engravings, and cartoons to great effect, each well captioned and complemented by sidebars that add historical context." As we celebrate Black History Month, it is important to honor many, many individuals who strove to reach their goals, who overcame the many obstacles that society threw their way. I want to make sure I'm giving my students a wide range of positive role models. This is truly an inspiring collection of real life stories. The review copy came from my local library, using Hoopla Digital. If you make a purchase using the Amazon links on this site, a small portion goes to Great Kid Books. Thank you for your support. Music brings people together, not only giving us joy but also creating a shared experience. Let’s Clap, Jump, Sing & Shout; Dance, Spin & Turn It Out! is an inspiring and impressive collection of African American songs, games and stories -- perfect for a home or school library. 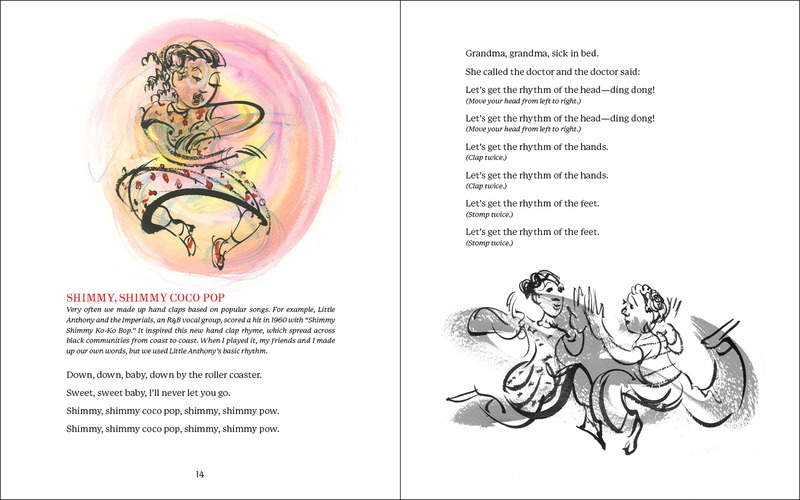 Veteran storyteller and author Patricia McKissack draws on her own childhood and adds substantial research to provide a comprehensive collection of songs, rhymes and stories. 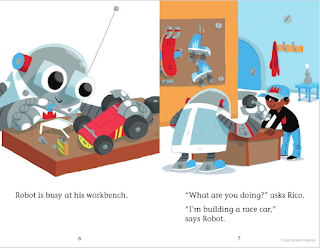 Explaining that “our earliest toys are our hands, feet, and voices,” McKissack encourages readers to try these songs for themselves. 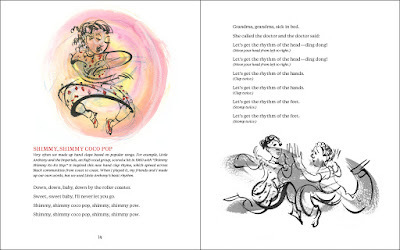 The book begins with hand games and claps for the youngest children, and then it moves onto the jump-rope rhymes and circle games school kids love. 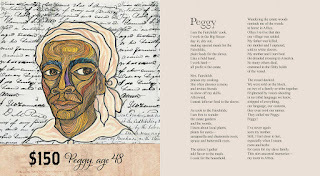 Chapters with poignant songs and stories inspired by the Underground Railroad and gospel music are especially important for their place in African American history. 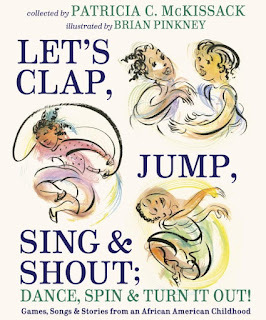 Brian Pinkney's illustrations dance and twirl across the page, full of movement and joy. They add a light playful touch in this heavy book (at 184 pages, it's a substantial volume!). I loved revisiting songs I knew and learning new versions--I couldn't help singing along while I read this! McKissack gives just the right amount of background information--never overshadowing the real joy of this book, the songs and games. She explains the roots of different songs, the ways they were adapted in African American communities, and how she played these games in her own childhood. "Very often we made up hand claps based on popular songs." Singing with your child is not only fun, it helps young children’s brain development. Hand movements, clapping and dancing all help children remember songs and reinforce the rhythm and beat. Like stories, songs build children’s vocabulary and help them hear that words are made of different sounds. Parents, teachers and children will want to dip into this volume time and time again. 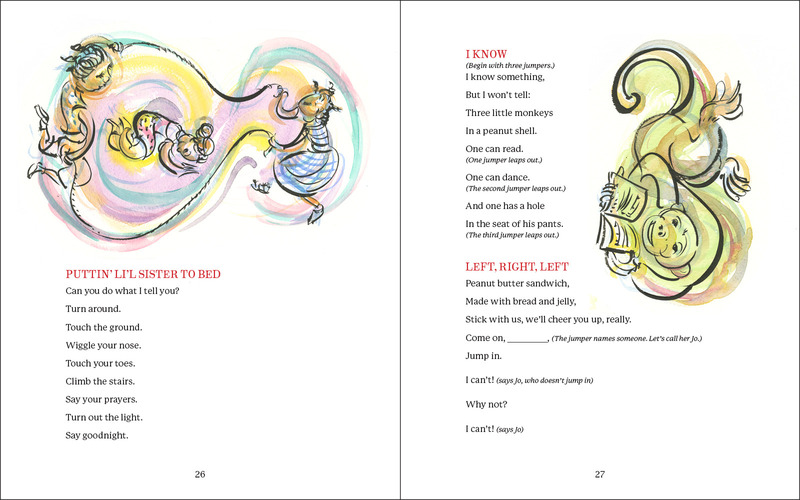 While the length makes this more of a parent or teacher resource, older children (ages 8-10) will have fun reading and trying out many of the songs and games. The review copy was kindly sent by the publishers, Random House. If you make a purchase using the Amazon links on this site, a small portion goes to Great Kid Books. Thank you for your support. My kindergarten & first grade nephews love-love-love racing cars, playing with Hot Wheels and driving trucks. Their play is full of imagination and fun. 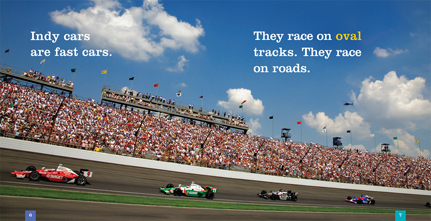 I want to bring these passions into their reading, so I'm constantly on the hunt for great books about things that go fast! Their favorite new book is the really big book: DK's The Big Book of Things That Go. This is full of pictures and information--but this works as a read-aloud for my nephews. What books might encourage them on the road to reading? Here's a collection of books just right for beginning readers. They are levels C through F, which are typical levels for kindergarten through first grade. All are available in paperback, perfect for home or classroom libraries. 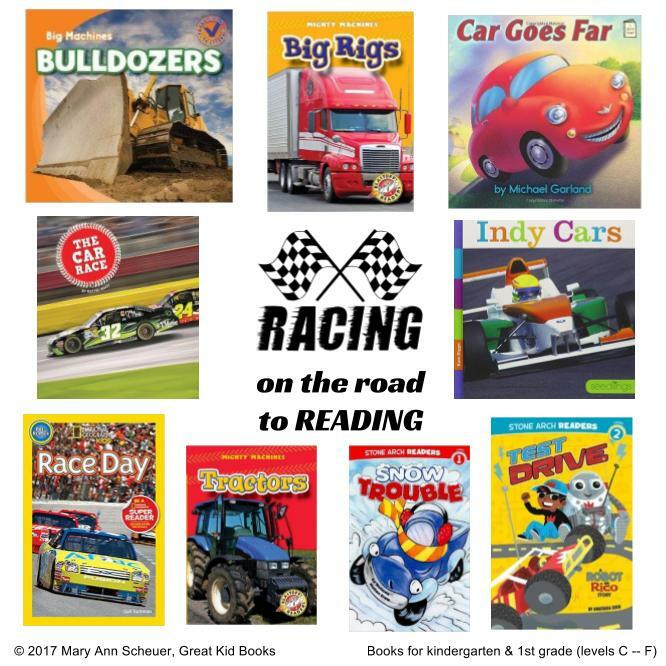 These books are a mix of fiction and nonfiction; some have stories, while others talk about features of different cars and trucks. If you like one, check for others in the same series (listed next to the title). Here are three samples of what these books look like on the inside. Notice the large print, simple sentences and pictures that help readers figure out key words. 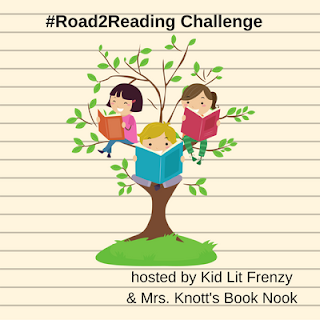 Do you want to find more books to support your kids on the road to reading? Check out the great series of blog posts by my friends Alyson (at KidLit Frenzy) and Michelle (at Mrs. Knott's Book Nook). The review copies came from my personal library. If you make a purchase using the Amazon links on this site, a small portion goes to Great Kid Books. Thank you for your support. We had a terrific time celebrating World Read Aloud Day (#WRAD17) across Berkeley Unified School District. Our kids were inspired; our guests shared their passion for stories; our smiles and laughter lit up every room. In Berkeley, it is indeed the Year of the Reader! This year's event was particularly inspired by Anna Dewdney, the author of the wonderful Llama Llama picture books. 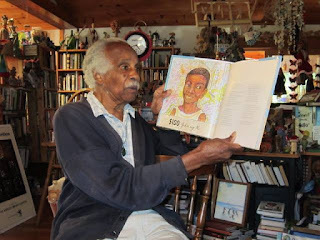 Dewdney was a strong supporter for reading aloud, writing in a Wall Street Journal commentary: “Reading with children makes an intimate, human connection that teaches that child what it means to be alive as one of many beings on the planet.” Dewdney died last year at age 50 after a battle with brain cancer. Our preschools celebrated with guest readers from the community reading Llama Llama Red Pajama in every classroom. As part of its commitment to honoring Dewdney's legacy, Penguin Young Readers donated books to every preschool classroom in Berkeley Unified. We are so appreciative. Find out more about the Anna Dewdney Read Together Award, another way that Penguin is teaming with national organizations to honor Dewdney's legacy. Our elementary schools celebrated with visits from three of their favorite authors: Annie Barrows, Laura Shovan and Kelly Barnhill. Wow-oh-wow, our students were excited to talk with writers about their work. Students asked thoughtful questions about how these authors get their ideas, they heard about how revision is hard work (even for professional authors! ), they were inspired to read more books and try writing their own. World Read Aloud Day "calls global attention to the importance of reading aloud and sharing stories." 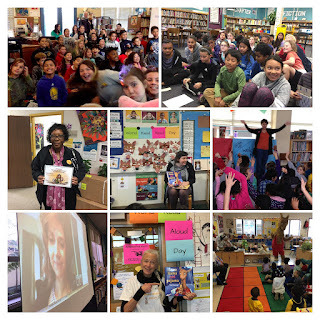 Founded by Pam Allyn and LitWorld, World Read Aloud Day motivates communities across the world to celebrate the power of words and stories, helping people take action to show the world that the right to literacy belongs to all people. Many thanks to our outstanding leadership from Becca Todd, coordinator of BUSD Library Services, and to the inspiration and support from Lit. World and Penguin Young Readers. 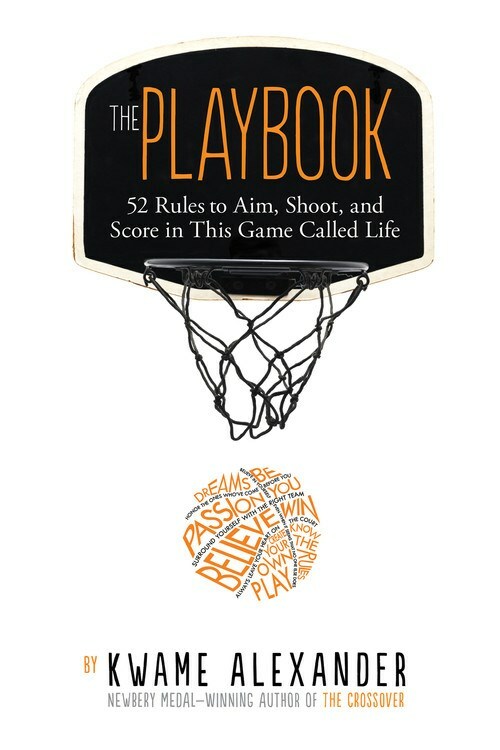 Kwame Alexander's newest book The Playbook: 52 Rules to Aim, Shoot, and Score in This Game Called Life publishes today and it is fantastic!! 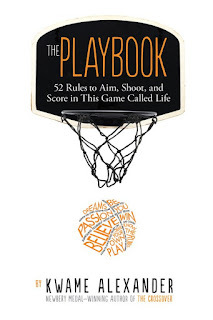 Kwame combines stories from his own life, photographs, and inspiring quotes--inspiring young readers to reach for their goals and give it all they’ve got. 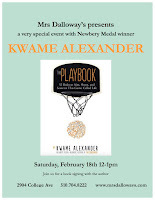 Kwame will be in the San Francisco Bay Area this weekend, with two public events. Come see him, friends, and bring your kids! 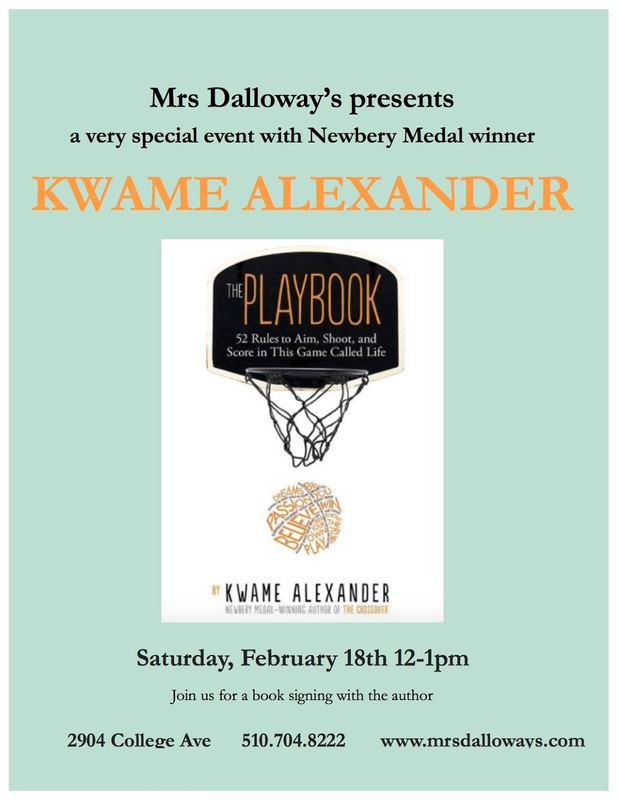 Saturday, come to Mrs. Dalloway's in Berkeley at 12:00 noon, for a fun, casual visit. He'll be signing books and visiting with his many fans in Berkeley. On Sunday, come to the San Francisco Public Library main branch at 2pm, where he will be in conversation with SF Human Rights Commission Director Sheryl Evans Davis. This event is free and open to the public. The review copy was kindly sent by the publishers, HMH Books for Young Readers, and I have already ordered many copies to give to friends and teachers. If you make a purchase using the Amazon links on this site, a small portion goes to Great Kid Books. Thank you for your support. Slavery is a shared story resting at the heart of American political, economic, and cultural life. African Americans constantly and consistently created new visions of freedom that have benefited all Americans. African American identity has many roots and many expressions that reach far back into our past. Our 5th graders are studying the American Colonies and the road to the American Revolution. Many wonder why the founding fathers could not address the fundamental contradictions between slavery and the freedom that the patriots sought. 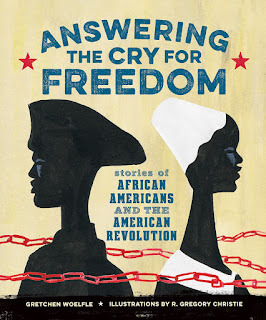 Gretchen Woelfle's new book, Answering the Cry for Freedom, is an excellent resource examining the way thirteen African Americans took up their own fight for freedom during the Revolutionary War and the establishment of our country--by joining the British and American armies; preaching, speaking out, and writing about the evils of slavery; and establishing settlements in Nova Scotia and Africa. I highly recommend this both as classroom resource and for students' independent reading. In the late 1700s, as the American colonists began to protest the tyranny of British rule, slavery existed in every one of the thirteen colonies. African Americans--both free and enslaved--listened as talk of freedom and the natural rights of men grew. How did they react? What did they say and do? As Woelfle writes, this collection of short biographies tells a "hidden chapter of the American Revolution." In short, well-organized chapters, she helps readers understand the complexities of their choices and they way these courageous men and women resisted the tyrannical customs and laws that kept slavery part of our nation for much too long. Striking silhouette illustrations by R. Gregory Christie draw readers in and provide a visual hook. The first installment tells about Boston King who grew up enslaved on a rice plantation in South Carolina, and joined the British Army in 1780 when they offered his freedom. When the British withdrew from Charleston, he traveled with them to New York and started life as a free man. Soon, he was then recaptured by a crew of an American ship who sold him to a man in New Jersey. He escaped again, rowing across the New York Harbor. Woelfe represents a range of voices of African Americans from the late 1700s: men and women, educated and not, Northerners and the Southerners. Three people I found particularly inspiring are James Armistead Lafayette, Elizabeth "Mumbet" Freeman, and Ona Judge. James Armistead Lafayette served the Marquis de Lafayette, acting as a spy as he served the British General Cornwallis. Students will be amazed that Lafayette was denied his freedom after the war because he was not enlisted as a soldier, but rather worked as an undercover spy. Woelfle combines clear description with many quotes from primary sources, documenting them clearly in her appendix. Elizabeth "Mumbet" Freeman sued for and won her freedom from slavery in 1781 Massachusetts--paving the way for the abolition of slavery in this state. Ona Judge was the slave and personal maid of Martha Washington, President George Washington's wife, who escaped to New Hampshire from Philadelphia--and resisted several attempts from Washington to bring her back. 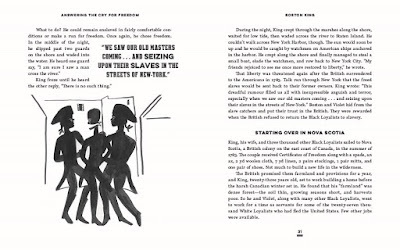 This engaging book provides a chance for young readers to learn about the death-defying attempts of black Americans to gain the inalienable rights promised in the Declaration of Independence...readers can appreciate how the American Revolution rattled the chains of slavery and expanded the boundaries of freedom beyond the Founding Fathers’ intentions. This book belongs in the library of every elementary and middle school. Read short chapters aloud with 4th graders, share chapters with groups of 5th graders, or encourage older students to read this fascinating book independently. 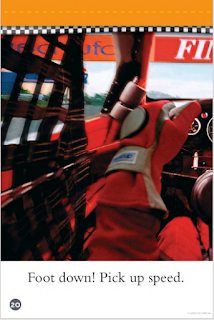 The review copy was kindly sent by the publishers, Calkins Creek / Boyds Mills Press. If you make a purchase using the Amazon links on this site, a small portion goes to Great Kid Books. Thank you for your support. I love listening to audiobooks -- but even more so, I love introducing children and families to this wonderful way of reading. Parents often ask me whether this is really reading, and I assure them that it is. Listening to an audiobook helps a child develop their comprehension skills as they imagine the story in their mind. The Audie Awards finalists have just been announced, and I'm having a great time exploring them. 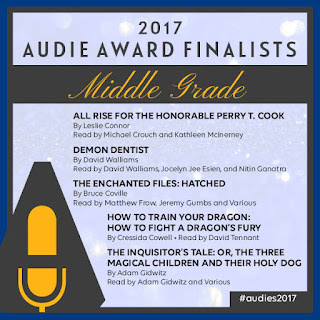 These awards are given annually by the Audio Publisher's Association, recognizing distinction in audiobooks. It considers everything from the narrator's performance to the editing and production qualities. Eleven-year-old Perry has lived with his mom at the Blue River Coed Correctional Facility his whole life. So far, Warden Daugherty has let him stay with his mother. I am looking forward to listening to this book -- one that's been recommended by several friends. AudioFile magazine writes, "This poignant story inspires questions about truth, justice, family, and home." Demon Dentist is perfect for fans of Roald Dahl's Matilda or The Witches. Alfie is reluctant to visit the town's new dentist--like many of us, he hates someone prodding in his mouth. But when Dr. Root visits his school, Alfie can immediately tell that something is not quite what it seems. The multiple narrators, including author Walliams, brings alive this colorful cast. I have just started listening to this, and Dr. Root is deliciously wicked in this goofy, outlandish story of tooth-rot and good-versus-evil. I thoroughly enjoyed listening to the first Enchanted Files book, Cursed, the diary of a mad brownie Angus who's curse brings him to modern America. In this new book, Gerald, a poetry-writing griffin named Gerald, tells his story in diary format, as he struggles with his worries whether he'll be brave enough to live up to being a griffin. Coville's signature wit and humor makes me look forward to listening to this--his stories have always been terrific as audiobooks. Many of my students love this series, and I know they're going to be excited to learn about this epic finale. I've always found the audiobook versions of these tales terrific because they convey Hiccup's accent and humor so well. From the publisher's summary, "The Doomsday of Yule has arrived, and the future of dragonkind lies in the hands of one boy with nothing to show, but everything to fight for. Hiccup's quest is clear... But can he end the rebellion?" The Inquisitor's Tale comes alive as an audiobook, with multiple narrators helping readers envision the different characters who come to the roadside tavern to tell their part of the story of three magical children and their quest. Gidwitz combines adventure, history, humor and action along with a story that helps us think about prejudice, collaboration and friendship, I read this story, and then listened to the entire story again as an audiobook. It is absolutely terrific. Gidwitz won a Newbery Honor (hooray!!) for this outstanding tale. I'm so glad it's also being recognized for the terrific audiobook. Have fun listening to these great stories. Thank you to all of the judges of the Audie Awards for helping bring these to our listening ears. The review copies borrowed from the public library. If you make a purchase using the Amazon links on this site, a small portion goes to Great Kid Books. Thank you for your support. 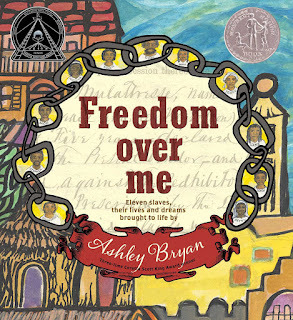 As I've honored Black History Month with my students, I've been reading aloud a powerful new book: Freedom Over Me, by Ashley Bryan. This compelling story will help young readers understand about the cruelties and injustices of slavery, but even more so it brings alive the hopes and pride of individual people caught in this cruel system. 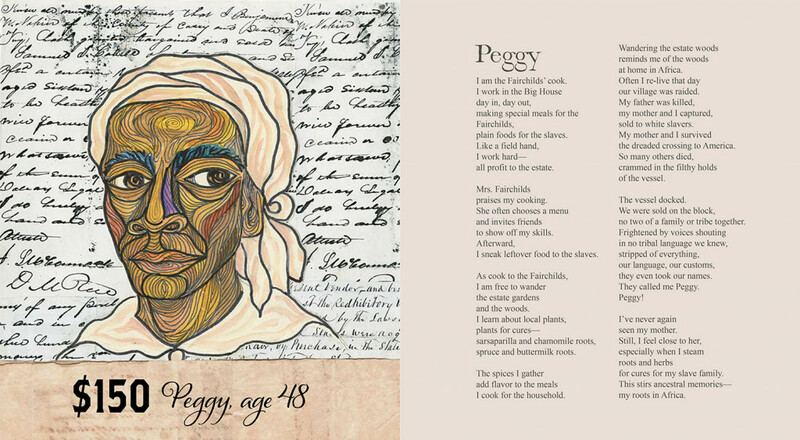 Based on an 1828 document listing 11 slaves for sale, Ashley Bryan created portraits of each slave using paintings and free verse poetry--asking each slave to tell their own stories. Bryan creates full lives for each person, helping readers understand their hopes and dreams, as well as their pain and struggles. Peggy: "I am the Fairchilds' cook. Each portrait helps readers look more closely, imagining these lives with empathy and compassion. Peggy works hard as the cook, and her mistress often invites friends over to take pleasure in her cooking. She is clear: all of her hard work profits the estate. As the head cook, she can explore the grounds, learning about local plants for cooking and for cures. Herb Doctor is the title Peggy most prizes, for it is when she prepares these cures that she feels pride and accomplishment. Steaming herbs "stirs ancestral memories--my roots in Africa" as she makes cures for her slave family. 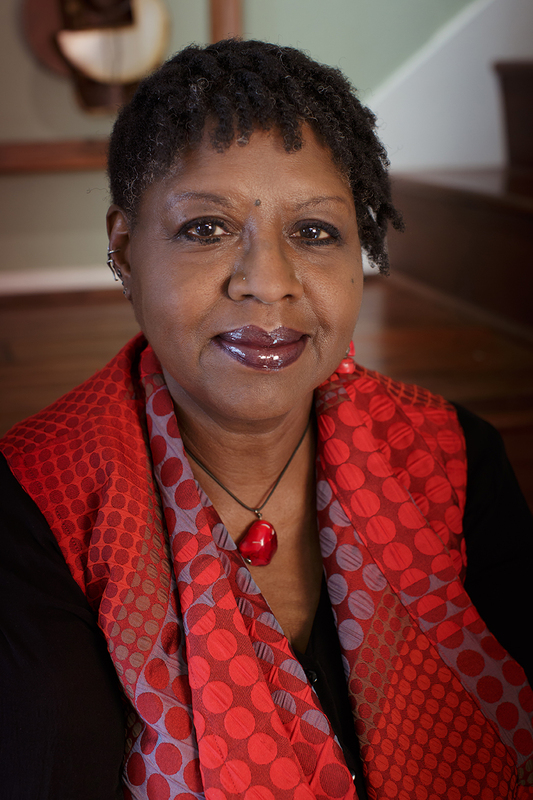 "After the 11 slaves told me their stories, I was deeply moved by their lives. Knowing that human beings all have dreams that we hope to realize, I thought of asking them what their dreams would be if they were living as free people. Their dreams are what brought each one to my heart and soul." Bryan's hope and optimism shines through in these stories. My students were able to think about the cruelties of slavery, but they were really impressed by the strength and courage of each person. They saw how important community, extended family, and personal history was to each person. Most importantly, my students understood the pride and accomplishment each person felt in their work and in their craft. I'd like to end with this video. I love the sense you get of Ashley Bryan's passion for poetry sparking a light in each person, for loving who you are, honoring what you create. 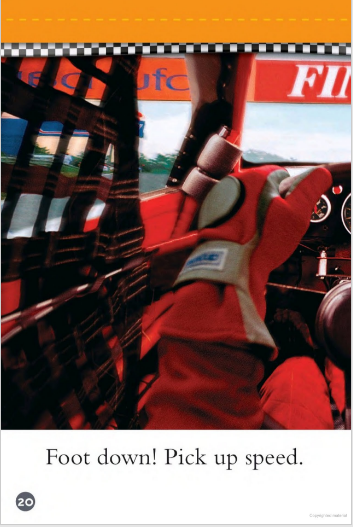 The review copy was kindly sent by the publishers, Simon & Schuster. If you make a purchase using the Amazon links on this site, a small portion goes to Great Kid Books. Thank you for your support. As we celebrate Black History Month, we honor those who have come before us, their struggles and their achievements. Poetry, literature, and stories help me do this in a deep and meaningful way. They help history come alive, help create connections and understanding. Today, Kwame Alexander--inspiring author of The Crossover (winner of the 2015 Newbery Award)--released a poem video on The Undefeated called "Take a Knee." It is incredibly powerful. Please watch this. Please share it. "We celebrate black history to honor those who came before us, who laid the foundation for this house we call America, who struggled and excelled, who took a stand for what they believed in, and sometimes died doing so. We REMEMBER each tremendous journey, we RECOGNIZE the calamities, and we RAISE our voices in solidarity. We take a stand. Together. For the children. For America. And, we live." We stand together; we hear each other's stories; we tell the world that our children matter. Poetry and video is an important communication tool. Thank you, Kwame, for these powerful words.